The creativity resulting out of the Berghain experience seems to have no limits. Over the last years we nearly saw everything: a bird house in the shape of Berghain, necklaces in the shape of Berghain, all sorts of illustrations and guides, music videos starring a fake Sven Marquardt and last but not least even an animated online game which works like a virtual trainer on how to get in. And we don’t even feature all the things that happen to be in shape or referencing to Berghain. We could fill a whole blog just about it, but we rather be called iHeartBerlin than iHeartBerghain, right? Jokes aside, the new card game called Bergnein ze Game is actually incredibly hilarious that it’s worth to be the 1001th post about the infamous club. In this card game you finally get the chance to play the feared door men and select between the guests including Hipsters, Gimps, Bloggers, Fag Hags, College Kids, Narcs, Bears, Cubs, Stoners, Club Kids and lots more. 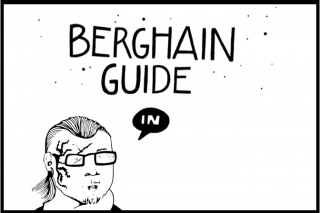 An Illustrated Guide on Getting into Berghain….The Line at Berghain by Nicola Napoli.